JBL Control 128W In-Wall Speaker DJParts - All Variety of Parts that DJ Needs. • 200 mm (8 in) polymer-coated aluminum-cone woofer with pure butyl rubber surround. • 25 mm (1 in) pure-titanium dome lowdiffraction swivel aimable titanium tweeter. • High-slope crossover for natural midrange sound. • Extended bandwidth performance of 30 Hz – 20 kHz. • 60W continuous (120W program, 240W peak) power handling (128W). 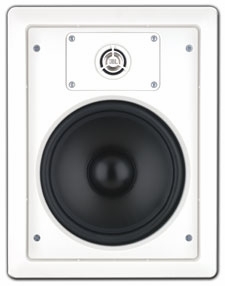 The Control 128W is a premium in-wall speaker within the JBL Professional Control® Contractor line designed for applications such as foreground music, boardrooms, reception areas, airports, convention centers, cruise ships, retail outlets, restaurants, museums, surround locations, or any critical listening application where top performance from a loudspeaker with minimal visual impact is required. The high-performance woofer features a polymer-coated aluminum cone for high performance down to 30 Hz and pure butyl rubber surround for long-life and high reliability along with extended-polepiece magnet design for long excursion and tight, low bass. The pure titanium dome high frequency driver is loaded with a built-in EOS™ (Elliptical Oblate Spheroidal) waveguide for low distortion and a smooth frequency response. A low-diffraction swivelmounting system enables the user to direct high frequencies where required without the diffraction distortion inherent in other aimable tweeter designs. A high-slope crossover network maintains natural midrange sound and produces more even coverage throughout the listening area. The optional Control 128WT version includes a multitap transformer for 70V/100V systems. The Control 100 Series speakers are voiced similarly to other JBL Control Contractor models, allowing mixing with surface-mount and in-ceiling speakers within a single listening space. The premium sound quality makes these loudspeakers ideal for critical listening environments, yet they are high power and rugged enough to handle venues requiring high-SPL, heavy duty-cycle music. The speaker fits into the wall space of ordinary stud-wall construction. An optional rough-in frame is available for installing the speakers into standard stud walls in newconstruction projects. As is the case with all Control Contractor speakers, the baffles and grilles are paintable to match any décor. Low-Frequency: 200 mm (8 in) polymer-coated aluminum cone, pure butyl rubber surround. High-Frequency: 25 mm (1 in) pure-titanium dome with cloth suspension on low-diffraction swivel-mount with -10 degree aimability. Crossover Network: 2nd order low-pass to the woofer and 2nd order high-pass to the tweeter. Outside Dimensions (H x W x D): 334 x 257 x 110 mm (13.1 x 10.1 x 4.3 in), 102 mm (4.0 in) front of wall to back of speaker. Cutout Size (H x W): 300 x 225 mm (11.9 x 8.9 in),Cutout template included.